It was supposed to be a straightforward transition stage. But even if Daniele Bennati won as expected, a late crash on stage four left favourites Carlos Sastre and Alberto Contador battered and bruised – and thanking their lucky stars they did not fare any worse. ?I bashed my knee in the crash, and I ended up colliding with [Astana team-mate] Levi Leipheimer and with my leg on top of his bike,? Contador said afterwards. ?It was a very tense finale, these bunch sprints always are, personally I?m just glad to get through and that I didn?t actually fall off.? His arch-rival Carlos Sastre (CSC-Saxo Bank), who ripped his shorts and suffered cuts and bruises when he scraped against some wiring on the side of the road at high speed, but he did not actually fall. ?It was the second time I got involved in a crash today,? Sastre pointed out. ?The important thing is that I didn?t lose time on my rivals.? The crash happened just 100 metres before the three-kilometre-to-go banner, meaning that any time lost would count in the overall classification. Initially it was reported that the time losses would not count – as is the case if riders are delayed by crashes which take place three kilometres or less to the finish. But commissaires finally stuck by the rules. Valverde, Contador and Sastre lost 19 seconds on the first riders across the line, Robert Gesink (Rabobank) 42 seconds, Damiano Cunego (Lampre) lost 2-16 and Andreas Klöden (Astana) lost 4-12. After all the excitement of the crash, the bunch sprint itself was relatively straightforward. Just eight riders managed to stay upright and in contention right at the front of the race, but they did include the two top sprinters in the Vuelta, Bennati and Tom Boonen (Quick Step). On Monday Liquigas had done most of the hard work on the run-in and Boonen had won, and on this occasion, ironically enough, just the opposite happened. Quick Step drove hard after the crash, but Bennati led out the sprint from a long way before the finish to take the fourth Vuelta stage of his career – and stay firmly in the lead. Boonen was so sure he?d lost the sprint he even sat up before the finish, a look of deep disappointment on his face. ?I didn?t see the crash and I could do my sprint just as I wanted,? Bennati said. ?Hopefully it?ll be the first win of several.? Wednesday’s stage, however, is definitely not for the sprinters. A 42 kilometre time trial through largely flat terrain round the town of Ciudad Real will force the gc contenders to show their hands – and big time. Touted as the big favourite, Contador is already playing it cool, so much so that he has named team-mate Leipheimer at the top favourite for the win. But if the Spaniard?s prediction is right and he?s not just bluffing, then who would be the Astana team leader for the rest of the Vuelta? Contador, poised to become the first Spaniard to win all three major Tours, or Leipheimer? Leipheimer certainly wouldn?t be on unfamiliar terrain if he led the Vuelta – in fact he knows the Tour of Spain like the back of his hand. 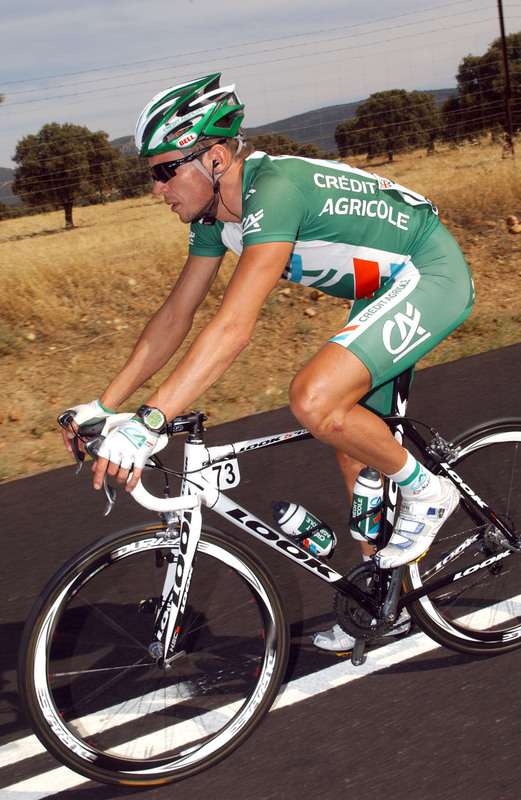 He remains the only American to have finished on the Vuelta podium – when he took third back in 2001. Seven years on, the man from Montana might be aiming slightly higher. 10. Sylvain Chavanel (Fra) Cofidis at same time.